The most desirable benefit of having a custom designed piece of jewelry is that no one else in th world will have the exact same piece. There may be similar designs but a totally custom jewelry piece will be yours and yours alone. Other benefits include the fact that it will be made to your exact specifications and will fit perfectly. It will be set with the stones that you own or that you select and it will be made with the finish and the color and type of metal that you desire so that it will reflect exactly what you want in a piece of jewelry. It may include the birthstones of your children or it may have a certain number of diamonds that represent a certain birthday or anniversary. But one thing is for sure, it will be totally unique and you will be the only one to have it in the world. 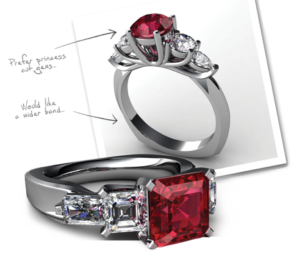 There are three main reasons why someone wants a custom designed piece of jewelry. The reason we most often hear is because our clients have inherited a piece of jewelry from a loved one or have their own stones and they want to re-set the gemstones into a new, more contemporary design. The second most popular reason is that people just want a totally unique piece that no-one else will have. The third reason that someone might want a custom design is that they have a specific design in mind that represents something that is special to them which might include everything from a certain beach scene to their company logo. At Suncoast Gems, we have been in the custom design jewelry business for 32 years. Owner, Tom Seguin began his career in the jewelry industry in 1984 a partner in Pure Excellence Fine Jewelers. A graduate of Stewarts International School for Jewelers Tom initially worked at the jewelers bench and ran the company which did custom jewelry design for the firm’s clients as well as for members of the trade. In 1985 Tom began his studies with the Gemological Institute of America and quickly earned his Graduate Gemologist degree. Seeing the need for a gemological laboratory and appraisal service, Tom split from his partners and opened Suncoast Gem Lab in Bradenton Florida in 1986. In addition to the gemological service and diamond brokerage services that Suncoast provided, Tom saw the ongoing need for the trade repair and custom jewelry services. So, he partnered again with former partner Roger Defouw and they opened another trade shop providing all types of jewelry repair, restoration and custom jewelry design. That partnership operated successfully with three full time bench jewelers for 15 years repairing literally over 30,000 pieces of jewelry and creating over 3,000 pieces of custom designed jewelry. The partnership dissolved in 2001 and Tom went on to service the needs of his private clients offering all of the same services as before. Tom holds the coveted Master Gemologist Appraiser title of the American Society of Appraisers which is held by fewer than 50 gemologists in the United States and continues to offer all of the related services including performing jewelry appraisals for all purposes including, but not limited to retail replacement valuations for insurance purposes and fair market valuations for estate purposes as well as providing new and estate jewelry items at prices well below that of local jewelers.